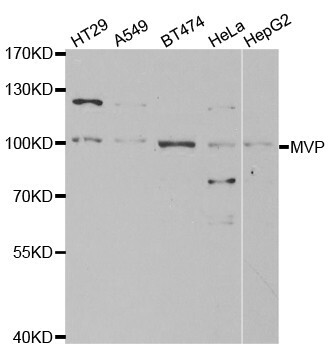 Search for all "Major Vault Protein"
Rabbit anti Human, Mouse, Rat Major Vault Protein. 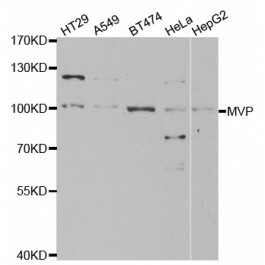 Recombinant protein of human MVP. This gene encodes the major component of the vault complex. Vaults are multi-subunit ribonucleoprotein structures that may be involved in nucleo-cytoplasmic transport. The encoded protein may play a role in multiple cellular processes by regulating the MAP kise, JAK/STAT and phosphoinositide 3-kise/Akt sigling pathways. The encoded protein also plays a role in multidrug resistance, and expression of this gene may be a prognostic marker for several types of cancer. Altertively spliced transcript variants have been observed for this gene.